So this small band of shell-shocked followers were commissioned to go to the nations and tell them about a savior and a kingdom that would never end--a little daunting to say the least. Though they did not understand how the power of the Holy Spirit would imbibe them, they had the hope that something bigger than them would actually "show up" to carry out this colossal mission. All throughout the book of Acts we see that indeed that is just what happened. Christ's followers are given the words, the courage, the strength, the abilities to do mighty works in the name of the Lord Jesus Christ through the power of the Holy Spirit. And the same is true for us! Sometimes the disciples are mocked and outcast. Other times their hearers are cut to the heart and many are saved; encouraging them in their message. They endure physical suffering and are the cause for public outcry, but still they are internally driven to speak the name of Jesus Christ. Is the same true for us? I confess I feel a little overwhelmed when I sit down to write a post like this. It seems too vast and too simple all at the same time. I know I don't share Christ as much as I should. I often take the safe, agreeable route in conversations rather than taking it somewhere eternal. Yet I am compelled to remind us (remind myself) how sharing Jesus is sometimes about just showing up, caring about someone enough to tell them your story, and taking a conversation in the direction of eternal things rather than the safe, predictable route. We will stumble in many ways, but the Bible promises the Spirit will give us words to say. We will never know if we won't open our mouth. 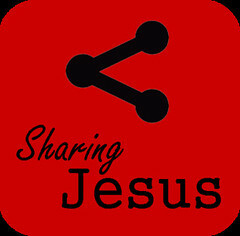 In Acts, many people came to believe in Christ through someone telling their story...sharing their testimony. The Apostle Paul was masterful at turning conversations toward the message of repentance and salvation. If we want to enlarge our hearts to share Jesus, perhaps we would be helped by reading through Acts and writing down the verses pertaining to evangelism as you go. The apostles did their part in evangelism by telling others how Christ saved them, but then trusted God to do the work of the heart. Their part was to be faithful with what God had entrusted to them--to tell the story. The same is true for us! We must be faithful to share the good news of salvation through Jesus Christ, our story. And God will do the work of the heart. Oh to tell you my story is to tell of Him!